Golden Living operates 295 LivingCenters and 12 Assisted Living Communities across the nation, caring for approximately 23,000 patients. It was facing the critical need for more efficient Accounts Receivable (AR) processes and a bank agnostic, integrated accounts receivable solution to best manage the processing of more than 10,000 items per month from its nationwide facilities. After a deep and thorough due diligence process, Golden Living chose Financial Transmission Network’s (FTNI) ETran integrated receivables hub as their solution, implementing its enhanced remote deposit capture solutions at their 295 facilities nationwide. ETran, by FTNI, is a flexible, cloud-based, integrated receivables processing platform and data warehouse ideal for businesses with one or many locations, payment channels, divisions or brands. ETran delivers a real-time, enterprise-wide view of all check, ACH, credit, debit, cash and mobile payments for superior receivables management. ETran is bank, merchant processor, scanner and back-office agnostic ― providing superior flexibility and configurability to meet clients’ evolving needs. 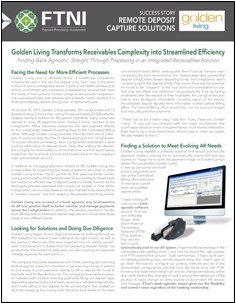 Find out more about how Golden Living has benefited by implementing enhanced Remote Deposit Capture functionality via FTNI's ETran Integrated Receivables Hub by downloading the complete success story now!